After breeding our barnevelders for a number of years, we are excited to have quality barnevelders with beautiful colours. We have standard double laced (gold and black), blue laced, splash and white. The Splash and Whites are new colours to us, and have only resulted from last years breeding program, so we look forward to seeing how they lay and what chicks they produce this year. The below diagram shows what may result, we will trial this and see how we go. 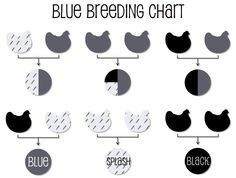 Listing for eggs in various breeding groups will be listed on this website soon when the breeding season kicks in later in the year. To express any interest, simply email chooks@goodlifestylestoday.com .